August 10, 2004 – Tonight I received an e-mail from Mathias van Singer, one of the Swiss passengers in Peter Tadd’s Fast Helicopter tour of crop formations on July 29, 2004. Originally, the helicopter pilot, Mr. Tadd and the Swiss tourists thought the “serpent” pattern appeared within one hour between Noon and 1 p.m. However, later it was confirmed that the farmer found the pattern at 5 a.m. that morning and crop circle researcher, Jonathan Sherwood, visited the site at 11:30 a.m. But the Swiss helicopter passengers are the only known group to get aerial photographs of the wheat formation before the farmer cut it out early the next morning. 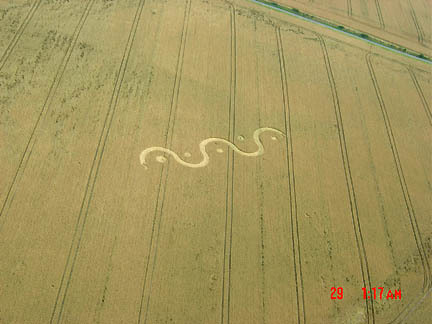 Here are four aerials attached to Mathias van Singer’s e-mail of the “serpent” pattern, followed by an excerpt from my August 3, 2004 Earthfiles report about crop formations in England, including the West Overton pattern. Mathias van Singer wrote, “Here are the pictures of the snake that have been taken by one man of the group of Peter Tadd (Irish tour leader), who is Jean-Claude Viret. The camera time was not morning. 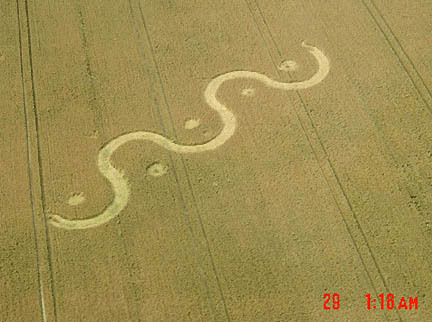 All agree the hour in which the tour and pilot became aware of the serpent pattern was between Noon and 1 p.m. Wiltshire, England time. All aerial photographs © 2004 by Jean-Claude Viret. 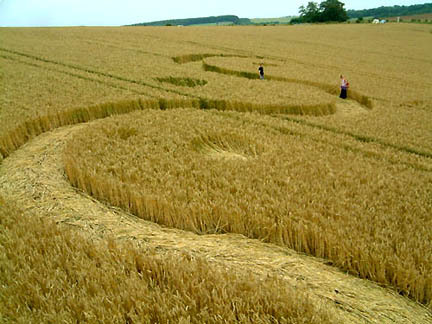 Serpentine pattern in West Overton wheat field near Avebury, Wiltshire, was discovered by farmer at 5 a.m. on July 29, 2004. Photograph © 2004 by Stuart Dike, Cropcircleconnector.com. “I was lucky enough to be the first person to go in and it was quite a beautiful, not large design. I would say the overall length of the serpent might have been 60 to 70 feet. But the details – what they call the lay of the crop on the ground – was so extraordinary. Along this undulating serpent, the wheat had been laid in such a way as to give almost a sense of like a diamond-back rattlesnake. As we walked along, the wheat was all laid in one direction on the two sides and there was this pattern in the middle (of plants laid back and forth on each other). As we walked, we also noticed there were three small circles, one each in the wave-like pattern of the serpent. There was a young 15-year-old boy with me who has been somewhat questioning the reality of these crop formations and how they are made. Then he looked at the perfect little circles and saw there was no entrance from outside. There was no way the circles could have been created without disturbing the wheat around them – he was convinced that this could not have been made by any person. Peter Tadd also talked with Stuart Dike from Cropcircleconnector about the helicopter pilot’s discovery of the pattern during the sixth flight at mid-day and Stuart wrote about it on the Connector. 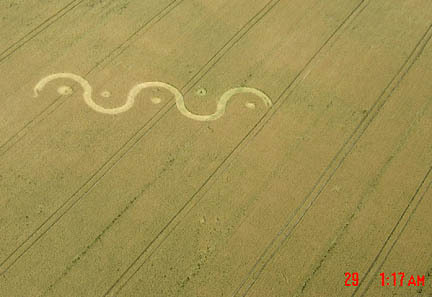 Word spread and on July 30, Bert Janssen from Holland called to tell me about the sudden mid-day emergence of the West Overton serpent pattern. But Lucy Pringle also called me today to tell me that Alton Barnes crop circle researcher and businessman, Jonathan Sherwood, had not only talked to the farmer who said he saw the serpent pattern at 5 a.m. that morning, but Jonathan had gone to the West Overton site himself at 11:30 a.m. and looked at the crop formation from the side of the road. 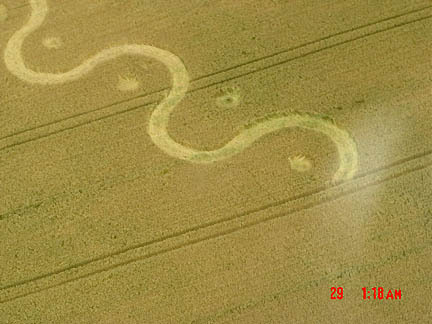 Thus, the “serpent” was definitely in the wheat all morning of July 29, 2004, while the Fast Helicopter tour flights were taking place. “Mike Harris (from Dartmoor), who was sitting over at Alton Barnes, rang me up and told me about it over the mobile. I said I was in Avebury and would just cut through West Kennett on the way back, so that’s what I did. He came up this year from Dartmoor just to drive around in his blue bus to look for patterns, like I do. He said he was heading back to Alton Barnes to the car park at the top of the hill. So I said I would go past there and take a look and when I got there, I thought, ‘Gee, that’s tiny!’ Had a quick look at it from the car. But I had an appointment to get to as well, so I just stopped the car, got out and stood by the field, and planned to see it again later in the day. SO, THE PILOT AND SWISS PASSENGERS ARE NOT CORRECT ABOUT THE FORMATION NOT BEING IN THE FIELD BEFORE THE NOON TO 1 P.M. TIME. Right, because I saw it myself at 11:30 a.m. But it would have been easy to miss from the air. The pathway of the S-shape or ‘serpent’ would not have been very wide, no more than 3 feet wide if that. A real skinny thing.